Microarray analysis has confirmed that many of the modifications of gene expression that occur in plants following attack by herbivorous insects can be accounted for by the effects of compounds (elicitors) released by chewing insects. Recent experiments have revealed coordinated up- and down-regulation of transcripts encoding proteins with related functions, suggesting that large-scale shifts in metabolism take place in insect-damaged plants. Higher plants are faced with the difficulty that they must survive and propagate while being immobilized within their local environment. There, they can be exposed to all types of abiotic stresses and to attack by living enemies aiming to use plant tissue as a home or a meal. An abundance of both direct and indirect defense strategies have evolved to protect plants from pathogens and herbivores. One key component of induced plant defense is recognition by the plant of the invading pest mediated by the presence of compounds - elicitors - coming from the pathogen or herbivore. Although increases in gene expression in response to plant wounding have been recognized for many years, it is only relatively recently that the plant responses unique to insect damage have been fully appreciated. The most likely candidate elicitors of these insect-specific responses are factors that originate in the herbivorous insect (Figure 1). Although plant-derived compounds can serve as signals of mechanical wounding, the known modulators of wound responses are less likely to be responsible for the specific responses of plants to herbivores. The advent of new tools for genomic studies, such as whole-organism genome sequences, databases of expressed sequence tags, and microarrays, has allowed a more thorough investigation of the changes in gene-expression profiles occurring in damaged plants. Recent studies [1–6] have used differential cloning techniques and microarray analyses to highlight the importance of insect-derived elicitors in bringing about significant changes in plant transcript profiles during herbivory. 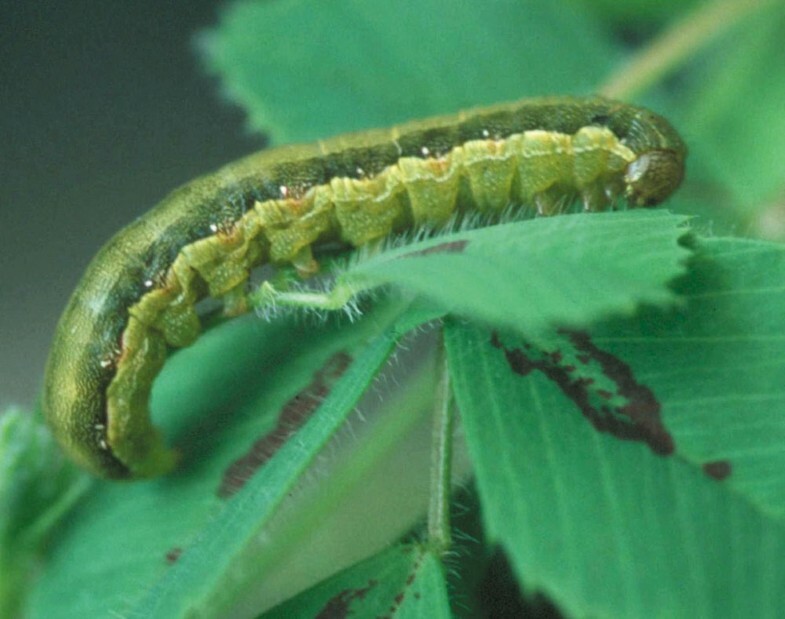 The beet armyworm, Spodoptera exigua, shown feeding on the model legume species Medicago truncatula; the first fatty-acid:amino-acid conjugates (FACs) to be identified as elicitors of plant defense responses were isolated from this insect. The best studied of plant physiological responses specific to herbivores is the systemic release of volatile organic compounds. Herbivory by arthropods, including mites  and lepidopteran caterpillars , stimulates the de novo synthesis  and release of plant-derived volatile compounds that attract natural enemies of the herbivorous pest. This plant response was used as an indicator during the isolation of one of the first insect elicitors characterized, N-(17-hydroxylinolenoyl)-L-glutamine or Volicitin' . This compound is a member of a class of fatty-acid: amino-acid conjugate (FAC) elicitors that are introduced into wounded plants during feeding by chewing lepidopteran caterpillars. Addition of volicitin or related FACs to a wound site causes a systemic release of volatile organic compounds that is similar in both quantity and profile to those emitted following insect herbivory. These FACs are thought to originate in the insect gut, where they are probably produced by bacteria , and they exit the mouth as components of regurgitant. Recently, an enzymatic insect signal affecting plant defense responses was identified in caterpillars of Helicoverpa zea, most commonly known as the corn earworm . Glucose oxidase (GOX) converts glucose into gluconic acid and H2O2 and is the most abundant protein found in labial salivary glands of H. zea . Addition of GOX from insect saliva to wounded tobacco plants suppresses the production of the defense compound nicotine and reduces levels of induced insect defense . Both GOX and FACs are potential mediators of plant gene responses. They are just two types among the many components from a chewing insect that might come into contact with a plant during the feeding process. A series of articles [1–5] from the laboratory led by Ian Baldwin at the Max Planck Institute for Chemical Ecology in Jena, Germany, describes the use of differential cloning techniques and microarrays to examine the gene-expression responses of Nicotiana attenuata (a wild relative of cultivated tobacco) in response to herbivory or to insect oral factors. Early papers in the series [1–3] used RNA gel-blot analysis to characterize the expression of a relatively small number of genes; some groups of genes could be distinguished as strongly up- or down-regulated in response to herbivory and/or insect factors. Added regurgitant from Manduca moth species was shown to suppress the induction of transcripts for several genes that are normally induced by wounding; these included a putative defense enzyme, threonine deaminase . In contrast, expression of wound-induced transcripts encoding a putative pathogen-induced oxygenase was amplified to high levels by regurgitant. Expression levels of some genes that were already suppressed by wounding were reduced further by regurgitant, including those of a gene encoding a subunit of light-harvesting complex II (LHB C1), a critical component of the photosynthetic machinery . The individual FACs found in Manduca regurgitant were identified and shown to elicit similar effects to those of complete regurgitant, suggesting that FACs have a critical role in insect-specific responses in N. attenuata plants . The suppression of genes involved in important metabolic processes such as photosynthesis led the authors to suggest that metabolic carbon flow can be redirected to defense responses after herbivory . The authors found a high degree of species-specificity in the genes induced by insects in different plants: none of the induced genes initially identified as insect-inducible in N. attenuata  showed high levels of sequence similarity with a set of previously identified insect-induced genes in Arabidopsis . The latest papers in this series [4, 5] used microarrays to characterize a set of gene fragments, combining those from an earlier study  with newly isolated sequences. Some sequences were selected by screening with cDNA differential display (DDRT-PCR) [1, 4] or subtractive hybridization using magnetic beads , comparing severely wounded N. attenuata plants damaged by Manduca species with undamaged controls. An additional 73 clones were identified using cDNA-amplified fragment length polymorphism (cDNA-AFLP), comparing water-treated wounded plants with regurgitant-treated wounded plants . Only 22 of the 73 gene fragments isolated in the latter experiment  had significant similarity to reported genes with known function, and at least 53% of the sequences were differentially expressed according to the subsequent microarray analysis. Of the sequences identified by DDRT-PCR , at least 60% were shown to be differentially expressed and a large percentage (73%) showed no significant similarity with genes of known function listed in sequence databases. Although the total of 241 sequences analyzed is relatively small compared with some microarray studies, this targeted approach of using differential cloning techniques for isolating gene fragments proved to be quite useful. Microarray analysis was shown to be a reliable method of measuring expression of genes in response to insect herbivory, as a large proportion (63%) of all of the arrayed gene fragments exhibited differential expression patterns . When the set of arrayed genes were categorized according to function of their protein products, it appeared that coordinated shifts are taking place in metabolic pathways towards allocation of more plant resources to defense . The importance of insect-derived FACs as elicitors of plant gene expression specific to herbivore damage is well demonstrated by these studies . Regurgitant collected from two natural pests of N. attenuata, Manduca sexta and a related species M. quinquemaculata, contained similar amounts of their most abundant FACs, N-linolenoyl-L-Gln and N-linolenoyl-L-Glu . A majority (68%) of the analyzed genes were regulated in a similar way when plants were treated separately with regurgitant of the two insect species, suggesting that similarity in the FACs in the two species might be a primary cause of the similar expression profiles in the plant in response to the two . Treatment with synthetic mixtures of the two most abundant FACs showed that these particular compounds could account for most of the observed accumulation of regurgitant-specific transcripts. Not all of the arrayed sequences responded identically to regurgitant from the two species, however, suggesting that there are still other unknown insect factors responsible for some species-specific elicitation events. The high proportion of transcripts responsive to FACs contrasts with the responses of genes following treatment with GOX, in which only 18% of the arrayed sequences reacted in a fashion similar to that following regurgitant treatment . Plant defenses are suppressed by GOX , whereas FACs are generally thought to induce plant defenses against insects. Both up- and down-regulated genes were included in these studies, so these results suggest that FACs, more so than GOX, have a predominant role in signaling plant gene responses in this experimental system. The complexity of insect responses brought to light by these analyses is revealed in expression patterns of the threonine deaminase gene. Although transcripts encoding threonine deaminase are strongly induced by herbivory and wounding , addition of regurgitant reduces its transcript levels . As with the effects of GOX on plants, this might indicate that elicitors from the herbivore are acting to suppress some defense responses in its host. Neither GOX nor synthetic Manduca FACs could suppress threonine deaminase expression or that of six other down-regulated genes, however, again indicating that other active insect factors remain to be identified. Likewise, neither FAC nor GOX was responsible for the regurgitant-mediated induction of at least three genes . Adding to the complexity of the insect-specific responses of plants, there is overlap at the molecular level between the responses to insects and to other types of stress. This was shown using Arabidopsis microarrays comparing the responses of insects to wounding and water stress; it turns out that water stress and mechanical wounding result in transcript profiles that are more similar to each other than to the profile resulting from chewing-insect damage . Microarrays measuring gene expression patterns in Arabidopsis under various conditions confirm the presence of a network of signaling pathways mediated by plant compounds such as jasmonic acid (JA), salicylic acid (SA), and ethylene [14, 15]. Findings in N. attenuata  confirm that simultaneous activation of genes believed to be controlled by SA, JA, and ethylene pathways also occurs in this species. It is well established that the plant hormone JA and related compounds serve as key modulators of the wound response. Another recent study used microarrays to show that in the systemic tissues of tomato, however, systemic induction of wound-responsive genes occurs in the absence of high levels of JA . Transcript profiles resulting from chewing-insect damage are probably very different from those that occur after damage by sucking insects. These two feeding strategies cause very different effects on plants , and microarray analysis of Arabidopsis plants damaged by aphids, which feed by sucking, has confirmed this difference at the level of transcript accumulation . In conclusion, microarrays are providing a more complete view of gene-expression patterns and, by inference, of the metabolic and signaling responses mediated by a variety of insect elicitors and endogenous plant signals. Groups of transcripts predicted to encode proteins with related metabolic functions are shown to be regulated in a similar fashion, and changes in expression profiles observed after herbivory suggest a substantial reallocation of plant resources to defense. Careful studies of metabolite profiles in herbivore-injured plants might usefully be applied in the future to address the possible metabolic shift indicated by the microarray data .